The fantastic Casdon Self Service Supermarket is part of their hugely popular "Little Shopper" brand and has been cleverly designed to copy the type of self service areas commonly seen in all of today’s modern supermarkets and local food shops. 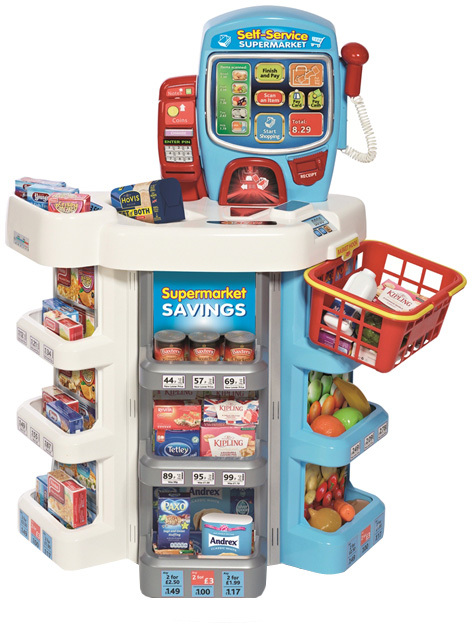 Not only is it crammed full of features like a chip-and-pin machine and scanner, but also has a series of realistic electronic noises, lights and speech. Standing 75 cm tall, this highly detailed role-play toy includes a selection of popular branded toy food packets such as Andrex, Birds Eye, Tetley, Hovis and Mr Kipling. A shopping basket is also included for selecting products from the weekly shopping list. Designed for children from 3-8 years old, the Casdon Self Service Checkout also encourages hand-to-eye co-ordination as well helping to develop problem solving skills. Play money is also included in this set which helps to improve counting skills. Please tell us what you think of the Self Service Supermarket by Casdon.